SW Motech BLAZE H Saddlebag Set. Black / Gray. Thruxton / Bonneville / T120 / Street Twin. Quite simply the best luggage system we have seen for the Triumph Bonneville twin range! 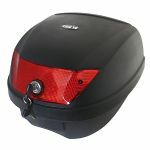 SW-MOTECH BLAZE H Saddlebag Set. Black / Gray. Thruxton / Bonneville / T120 / Street Twin. For securing to "Throw Over" pannier rails. To keep with the “retro” image of the Bonneville family it features the old Meriden Triumph Logo in gold on each side. Tank Bag For The Bonneville 'Pseudo' Tank Rack: (Meriden Logo) SUB Standard! Clearance Price! SUB Standard due to Zip problem. An elegant Inspiration from the 60's Triumphs.